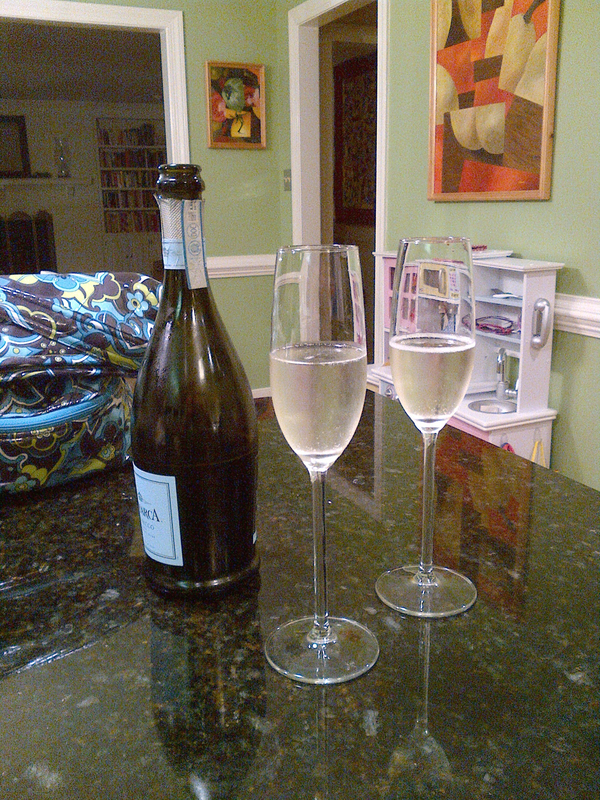 To celebrate the 9,000th download (what the freaking what?!?) of our Wine Totes Free Pattern on Craftsy, we decided to republish our most popular pattern as a tutorial. Enjoy! 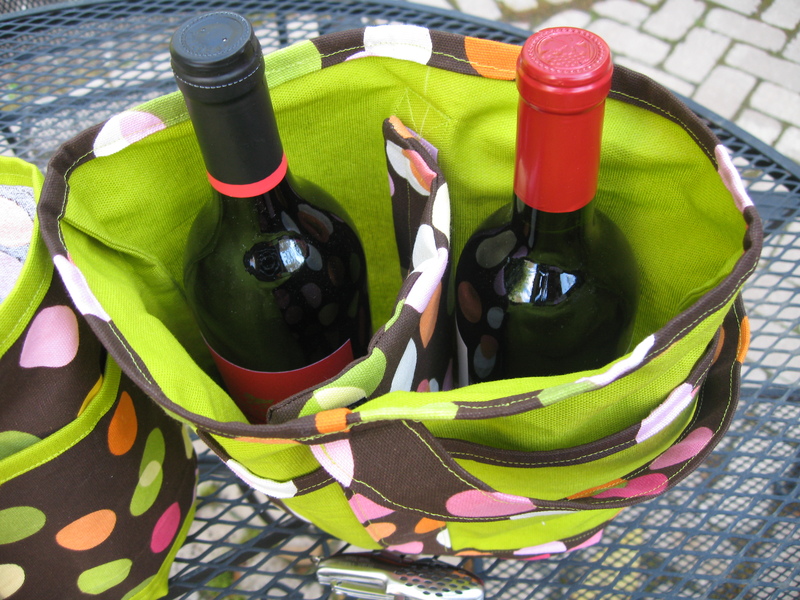 What’s more fun than one cute tote to carry your favorite wine? Two complimentary totes made from the same tutorial. These wine totes feature a padded divider so you can carry two wine bottles or one bottle and other supplies (plastic wine glasses, anyone?). Includes two outside pockets for a wine opener or other small items. This tutorial also has step-by-step instructions for French seams for a professional finish that even a beginner can follow. Wine Totes are about 12” tall, 10” wide, and 5” deep. Read all instructions before cutting and sewing. For strength and durability, use canvas, duck cloth, outdoor fabric, or something of a similar weight and weave. When adhering batting, place it fusible side up on ironing board, then place fabric, right side up, on top. Place another scrap piece of fabric (i.e. pressing cloth) between the iron and your fabric. Test any disappearing inks or chalks on fabric before making any marks to ensure they will not be seen later. You can also use masking tape to mark lines and remove it after sewing. If you have trouble with needles breaking when sewing through several layers of fabric, switch to a heavier needle rated for denim/canvas (e.g. 100/16). If you have trouble with your thread breaking, switch to an extra strong/upholstery weight thread. NOTE: If using directional prints, you may need to buy more fabric than stated. 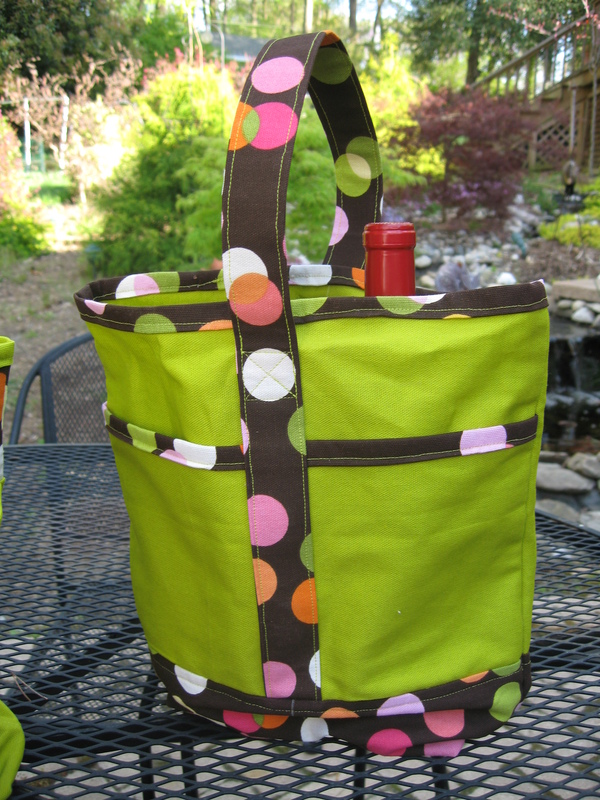 When sewing Wine Tote #1, use Fabric A for the Body and Pocket and Fabric B for the Bottom, Handle, Binding, and Divider. 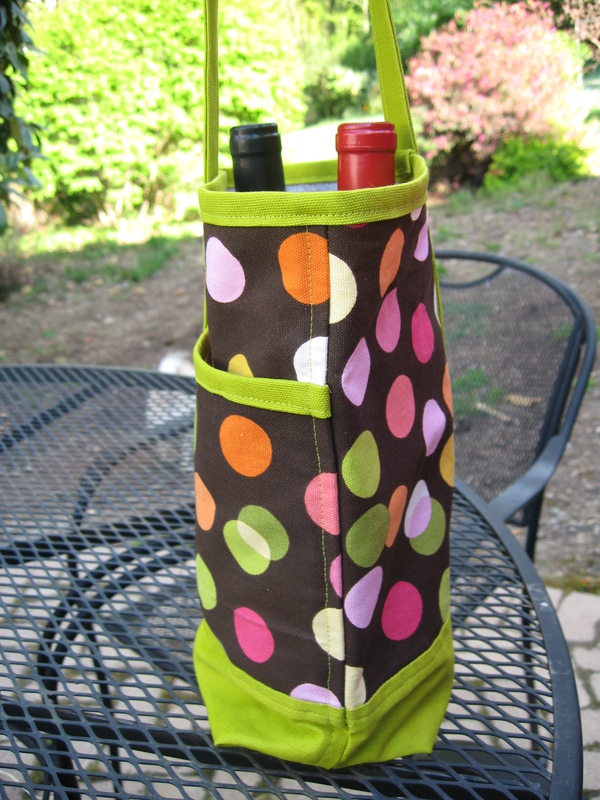 When sewing Wine Tote #2, use Fabric B for the Body and Pocket and Fabric A for the Bottom, Handle, Binding, and Divider. NOTE: All of the construction seams are French seams (¼” WST and ½” RST), but they will be explained step-by-step each time. If you’ve never done a French seam, it will seem really weird and counter-intuitive, but they will give you an amazing finished product! Let’s start by assembling several different components of the Tote. 1. With Handle wrong side up, press both long sides with raw edges folded towards the middle. 2. Fold in half lengthwise and press. NOTE: You may need to use steam to lock in the fold. 3. Repeat Steps 1-2 to make the Binding. 1. Sandwich one of the long sides of the Pocket inside the Binding. Measure and cut Binding the same length as the Pocket. 2. 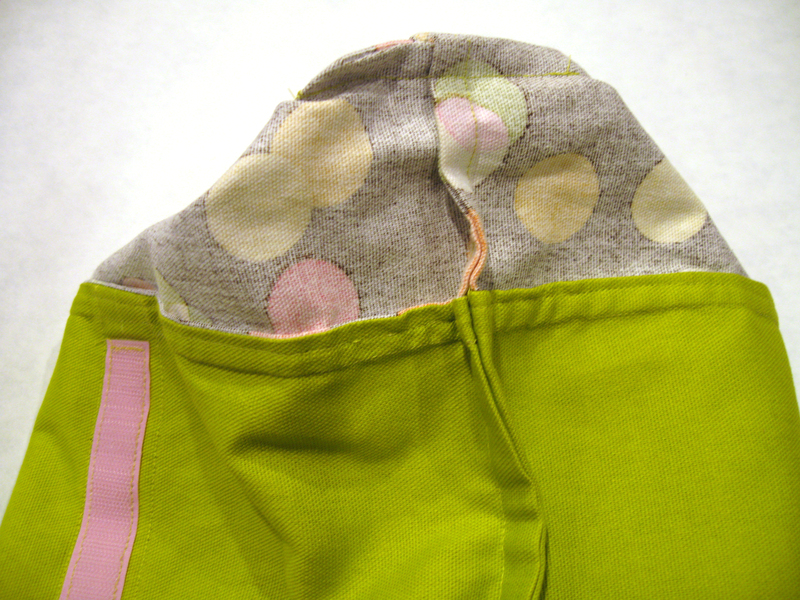 Pin Binding to Pocket and sew with ⅛” seam. 3. With right sides up, place Pocket on top of one of the Body pieces, aligning the bottom edges. Baste ⅛” along the two sides and bottom to hold Pockets onto Body. 4. Draw a vertical line down the middle (6 ¾” from either short side) on both the right and wrong sides of both Body pieces. 5. On the wrong side of one of the Body pieces, sew the loop side of the Velcro centered on the line drawn in Step 4, starting 1” from the bottom. 6. Repeat Step 5 with the other Body and Velcro piece. 7. On the right side of one of the Body pieces, pin Handle centered on the line drawn in Step 5, aligning the bottom edges. 8. Sew a scant ⅛” seam along the left side of the Handle. Stop 1” from the top of the Body, but don’t remove your needle. 9. Sew across the Handle, and then back down the other side with another scant ⅛” seam to mirror the seam in Step 8. 10. Add a box stitch on the Handle for support and decoration. We made the box 1 ¼” long, but feel free to use whatever size you like. 11. Repeat Steps 7-10 on the other Body piece being careful not to twist the Handle. 12. Fold the top of each Body piece behind the Handle so you don’t sew over it. Starting at one of the box stitches, continue the scant ⅛” seam along the side of the Handle all the way to the top of the other box stitch. 13. Repeat Step 12 on the other side of the Handle. Now let’s work on constructing the Tote itself. Here come the French seams! 1. With WST, place one of the Bottom pieces on top of one of the Body pieces, aligning the bottom edges. Sew together with ¼” seam. Press seam to one side. 2. Fold at the seam so that Bottom and Body pieces are RST and press. Sew ½” seam, encasing the seam made in Step 1. 3. Press seam towards Bottom. 4. Topstitch ¼” below the seam on the Bottom. 5. Repeat Steps 1-4 for the other Body and Bottom pieces. 1. With WST, match Body to Body and Bottom to Bottom, making sure you match the seams where the Bottom attaches to the Body. NOTE: Be careful not to twist the Handle. Sew ¼” seam along both sides. 2. Press seams to one side. Flip Tote inside out so that the Body pieces are RST and press. Sew ½” seam along both sides, encasing the seams made in Step 1. NOTE: Go slow at the seam where the Body and Bottom meet. It will be very thick and could break your needle. 3. Press seams towards the front of the Tote (the side with the pocket). 4. NOTE: If desired, topstitch ¼” from the seam on the front of the Tote along both sides. There will be several layers of fabric, so your machine and/or needle may not be able to handle it. 5. With WST, sew Bottom closed with ¼” seam. Press seam to one side. 6. Flip Tote inside out so that the Body pieces are RST and press. NOTE: Don’t worry about pushing out the points at the corners because you will be boxing them in the next step. Sew ½” seam along the bottom, encasing the seam made in Step 5. 7. Flip Tote right side out. With WST, align the side seam with the bottom seam to “box” one side of the bottom of the Tote and pin. Draw a line across the ends at the point where the Tote measures 2 ¾”” from end to end. Sew along the line, then trim to ¼” from the seam. 8. Repeat Step 7 for other side of the bottom of the Tote. 9. Turn Tote inside out, push out points, and press seams to one side. With RST, sew ½” seams on both box seams, reinforcing at both ends. 10. Flip the Tote right side out. Starting behind the Handle, sandwich top of the Tote in between the fold of Binding and pin. Overlap the Binding 1”, then cut and fold back the Binding ½” to encase the raw edge. Sew to the Tote with ⅛” seam. NOTE: Be sure not to sew over the Handle. 1. Iron on or place batting on the wrong side of one of the Divider pieces. 2. With RST, sew Dividers together with ½” seam along three sides, leaving one short side open. Clip corners, trim batting close to the seam, and turn right side out. 3. Fold opening inside itself by ½”, press, then sew closed. 5. On one side of Divider, sew the hook sides of the Velcro along each long side. 6. Attach Divider inside the Tote. And, we’re done! 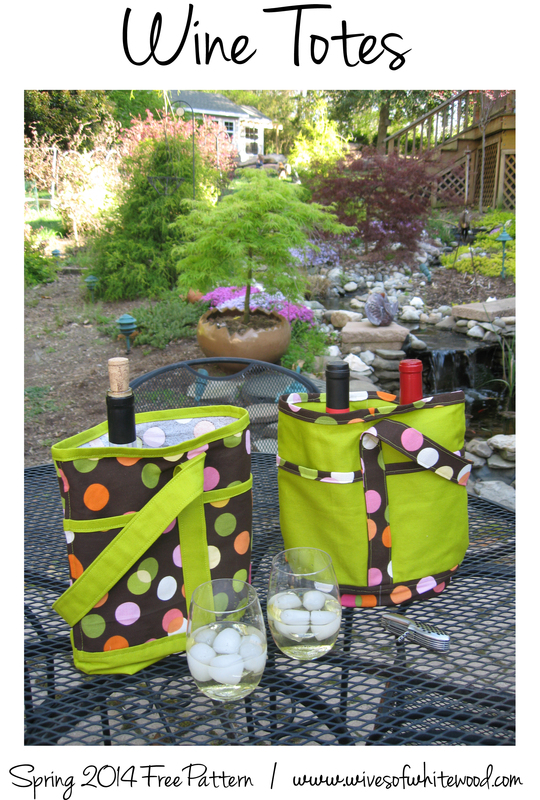 To make your other matching Wine Tote, follow the tutorial all over again, but with the opposite fabrics! Then step back and admire your beautiful Wine Totes, and use them with pride. Or, if they’re not so beautiful, give them to someone else as a gift. People love handmade gifts. 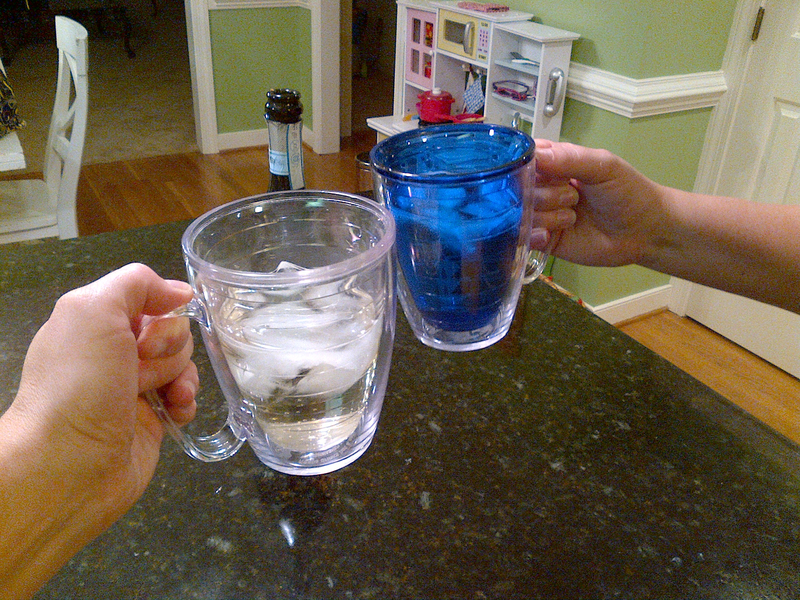 Yes, those are Tervis’ full of champagne and ice. You are now free to do it yourself – you’re welcome. All you need to do is head to our Facebook page and like the post about this giveaway. Alternatively, you can enter the giveaway by commenting on the post – maybe something about how much you admire someone for going public about their classy use of Tervis-ware. The winner (chosen by random.org) will get a free pattern of their choice from our Spring 2014 collection, and the giveaway will be open until Thursday at 5pm. Good luck and spread the word!